WAS AN ISLAND HOOKE DISCOVERY SUPPRESSED BY ACADEMIA ? From the outset of the 2003 Robert Hooke tercentenary celebrations the absence of any portrait prompted much discussion as to his likely appearance. By year end two quite different images had been discovered, both of which were speculative. One was found on the Isle of Wight by a local historian, the other by a prominent academic. Guess which one got the publicity? The Island discovery was in the form of Robert Hooke's seal (above right) found on a document at the County Record Office. We reported this back in June anticipating some national publicity. Although the story was distributed to the press it was never published. It seems the press took the story to the professor responsible for much of the Hooke tercentenary activity. He informed them the face was definitely not Hooke by making the sweeping claim that nobody of the period ever had a seal in their own image. When his view was challenged he refused to correspond on the matter. It may seem somewhat drastic of the professor to deny the seal even a little controversy but, at the time, he was probably one of the few who knew of another claim already in the pipeline . . . In September popular historian Lisa Jardine published a Hooke biography, the cover of which carried what she declared was his portrait (above left). She discovered it in the Natural History Museum. Her evidence that the portrait is of Hooke amounts to no more than circumstantial supposition. In fact the portrait actually carries the name of John Ray, a 17th century botanist. Moreover it doesn't look too different from other known portraits of Ray. Nevertheless the press embraced this story wholeheartedly and gave it full publicity. Perhaps this episode says something about the gullibility of the press at the hands of a professor or two. It may also be a comment on academic pride and elitism. Doubtless in the course of time Jardine's speculation will become fact and the Island seal will be long forgotten. Thus history is made. Over the years the old Osborne House Stable Block has become dilapidated. The present owners are refurbishing it and, with the help of local history organisations, hope to establish it as an exhibition centre for Island heritage. The Stable Block was built in 1861 and is at the centre of a building complex just to the south west of Osborne House. It was an integral part of Osborne House until the Queen's death in 1901, after which Osborne Estate was made a gift to the nation. In 1903 the Royal Naval College was established on the premises and it underwent a major conversion providing classrooms, dormitories and a dining hall. The college was disbanded in 1921 but the buildings continued to be used by various voluntary organisations. In 1940 it was commandeered by the government to accommodate Saunders Roe in their contribution to the war effort. After the war Saunders Roe obtained a leasehold and continued to use it as their design offices until 1987. Thereafter occupation was spasmodic and the buildings fell into considerable disrepair. The present owners acquired the lease in 2000 to house their business in accompanying buildings. They are keen to restore the Stable Block and have already spent much time and money towards that end. Whilst the building naturally invites the prospect of exhibiting its own history, the sheer size of the facilities open up the possibility of a whole range of exhibitions. The Isle of Wight Society has taken the lead in seeking to establish an umbrella association to raise finance and oversee Island heritage organisations in mounting their own exhibitions. The aim is to establish a focal point for Island history. The project is still in its embryo stage but a number of interested parties are already involved in establishing an association. Any organisation seeking further information can contact David Burdett on 01983 296718. 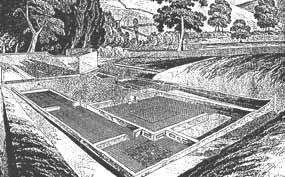 This illustration shows Carisbrooke Roman Villa following its Victorian excavation. Its pristine appearance belies the neglect and destruction that followed. The antiquarians responsible for the excavation lacked sufficient understanding of conservation and set in train events leading to its dilapidation and ultimate burial. Now the IW County Archaeology Service intend to bring the site back into the public domain for the benefit of education and tourism. The villa was discovered in 1859 when Roman stonework was found in foundation trenches for a new stable building in the grounds of Carisbrooke Vicarage. When excavated, it revealed a building over 35 metres long built of chalk and mortar walls, included rooms with mosaic floors, a heated bath room and other rooms off a corridor. It is likely that Carisbrooke was an important place in Roman times and the villa may have controlled agricultural produce from the fields of the surrounding Bowcombe valley. The site was never given a protective cover but left open for public view. Exposure and neglect inevitably brought about its gradual ruination. In the 1930s a misguided attempt to lift a mosaic floor resulted in enormous destruction. The site was backfilled in 1976 and has since become overgrown, with the roots of trees and shrubs probably causing more damage to walls and buried deposits. The County Archaeology Service has obtained a grant from English Heritage to protect and enhance the archaeological remains. Work has begun on clearing the ground of its overgrowth and Ruth Waller, the County Archaeologist, will be working with Carisbrooke West Forum and the local community to produce a 'Conservation Statement'. This will identify ways in which the site can be developed to best serve public interest.